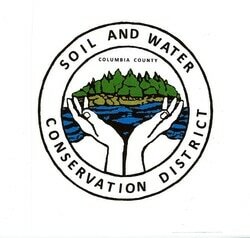 Columbia County SWCD is able to provide residents with photo quality print outs of infra red aerial images from 1996 and 2001 flights over Columbia County and color 2006 and 2007 aerial images. Historical aerial images of Columbia County from the years 1942, 1947-1948, and 1959 are available. To view these images you must visit the District office. Images can be scanned or photocopied. We are able to overlay tax parcel boundaries, soils information, wetland determinations, streams and water bodies, watersheds and other types of information. The charge for this service is $20.00 per 8.5 x 11 color print out. No charge for emailing images. Laminated maps $14.04 (tax included). New York State DEC Freshwater wetlands map/quads are available for reference and photocopying at the District office.